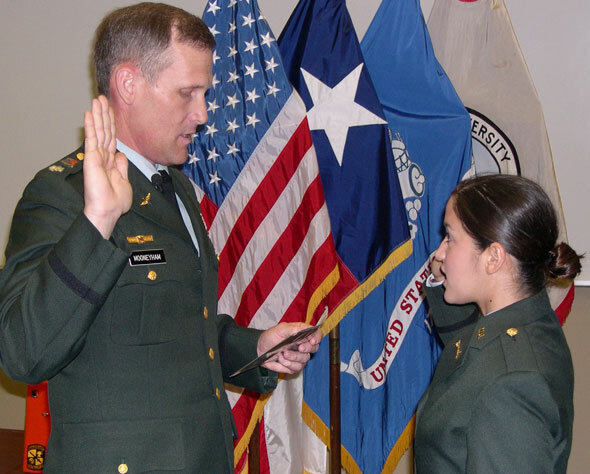 (Above) Lt. Col. Alan Mooneyham, chair of the military science department, administers the Oath of Office to cadet Vanessa Moreno during the spring commissioning ceremony on Friday (May 13) afternoon. The ceremony was held in the James S. Olson Auditorium, in Academic Building 4. 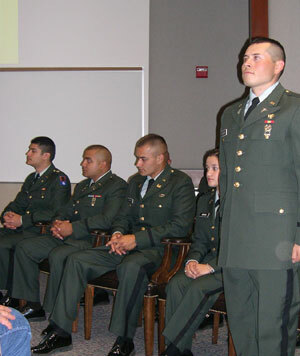 (Right) Five cadets were commissioned as Second Lieutenants in the U.S. Army, including (from right) Ralph T. Salazar, Moreno, Keith M. Herzog, Juan A. Cantu, and Patrick S. Alexander. Salazar will serve as temporary cadre within the military science department before being assigned in active duty within the medical service and aviation branches. Moreno will report to Military Police Officer Basic Course at Fort Leonard Wood, Mo., before her first duty assignment at Fort Bliss, Texas. Herzog will attend the Engineer Officer Basic Course at Fort Leonard Wood before being assigned to the U.S. Military Joint Task Force at Guantanamo Bay, Cuba, a first, according to Mooneyham. Cantu will report to Field Artillery Officer Basic Course at Fort Sill, Okla., before serving his first duty assignment at Fort Hood. Alexander will attend Aviation Officer Basic Course before returning to SHSU to work on his Master of Science degree in Criminal Justice leadership.